I couldn’t decide, when I turned the last page, if The Gates of Evangeline was really the murder mystery I was led to believe it was going to be not far in from the first page. And that’s a good thing. Hester Young did a fine job of keeping me on my toes, wondering what would be around the bend, especially the times Charlotte Cates, her main character, physically and imaginatively, rowed through the Louisiana bayou in a rickety little boat near the grand Southern home Evangeline. I can’t remember now if Charlotte actually saw alligators in the water around the boat or if Young simply did a fantastic job of making me feel my least favorite of the animal world all around the journalist as she searched for clues and answers to the disappearance of a preschooler. 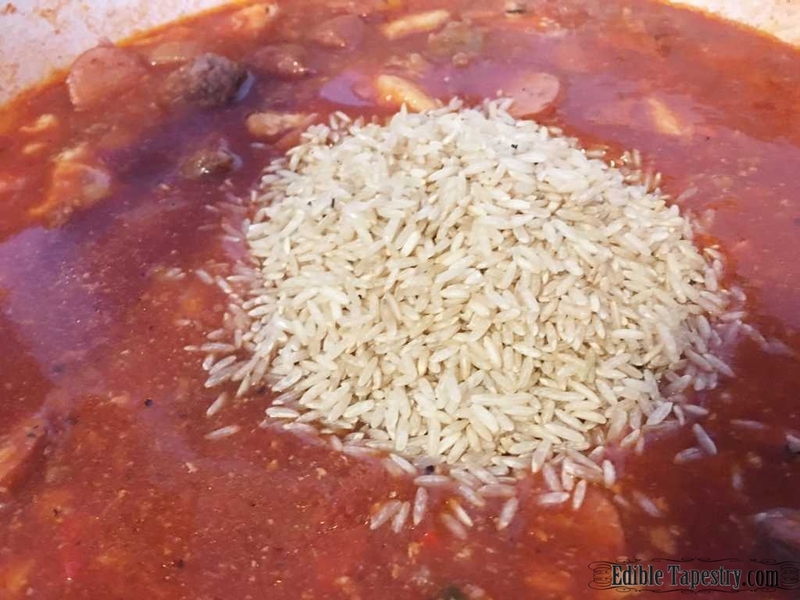 When she was able to get away from the tragedies that seemed to shroud Evangeline and enjoy a festive trip to New Orleans during Mardi Gras, I decided that I’d make a big pot of jambalaya, loaded with sausage, to go along with this book. I have made it with andouille and shrimp on other occasions, and it certainly is easy enough to throw a half pound or so of shrimp in near the end of the dish’s cooking time to make a traditional jambalaya, but to keep this batch simple for those wishing to make it for book club meetings, and safe for those with shellfish allergies, I used two kinds of readily available sausage, along with cubed chicken breast, to create this recipe. 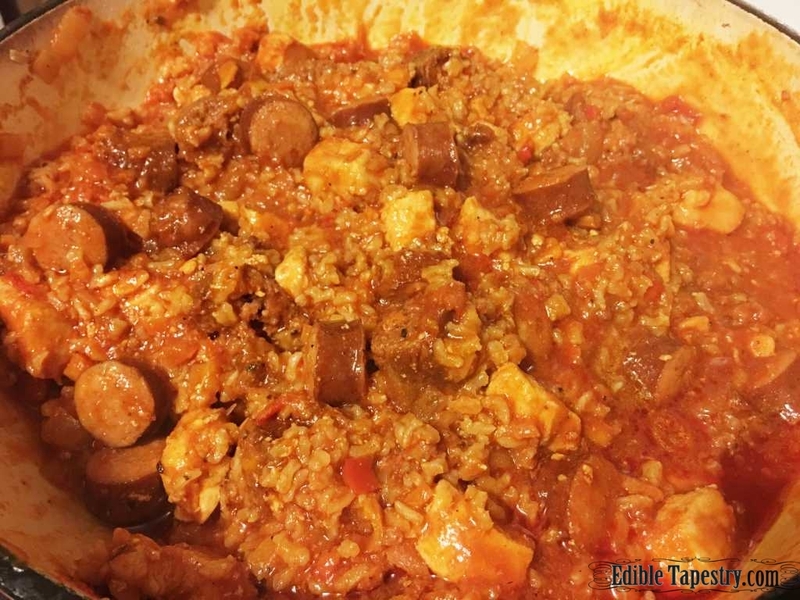 I used one pound of andouille and one pound of boar meat Italian sausage, not something you can find in the grocery store but appropriate for my “bayou” jambalaya, since wild boars abound in Southern swamps. 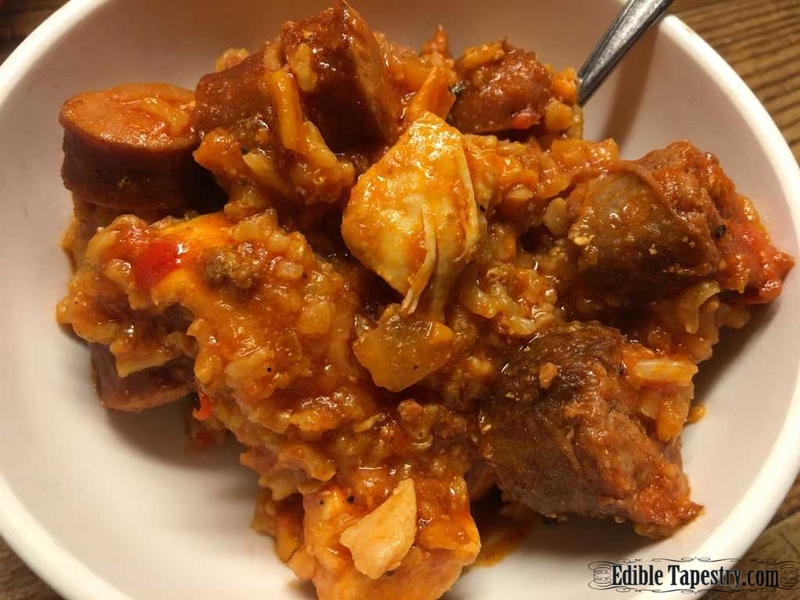 Any spicy Italian sausage would work fine with the cajun spices that are added to jambalaya, if andouille isn’t available in your local store or region. 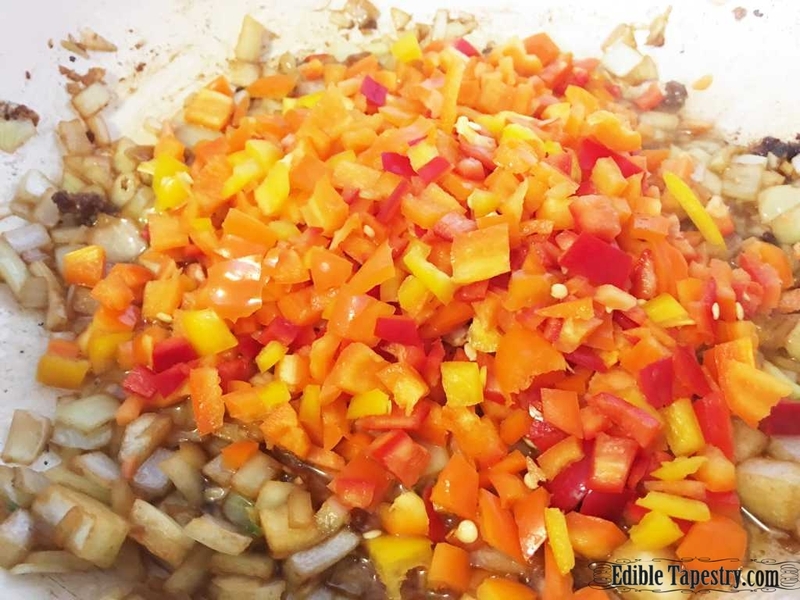 The “holy trinity” of Louisiana bayou cooking– bell peppers, onions, celery — might already be in your refrigerator, they are such common ingredients. I brightened things up by using small, sweet red, orange, and yellow bells, but stayed with the traditional French mirepoix by adding a little bit of diced carrots to the mix. I didn’t miss the shrimp this time around, but loved the change of having nice plump pieces of chicken all through the dish. If you prefer to use shrimp, or would like to add it, just toss peeled, de-veined raw shrimp into the pot the last 5 to 10 minutes of cooking. 8 oz. bell peppers, small dice. In a large Dutch oven or stock pot, heat the oil over high heat. Add the garlic. Sweat until translucent. Add the onions and sweat to translucent. Stir in the peppers, celery, and carrots. Sauté until translucent but not brown. Add the parsley, basil, and chicken breast. 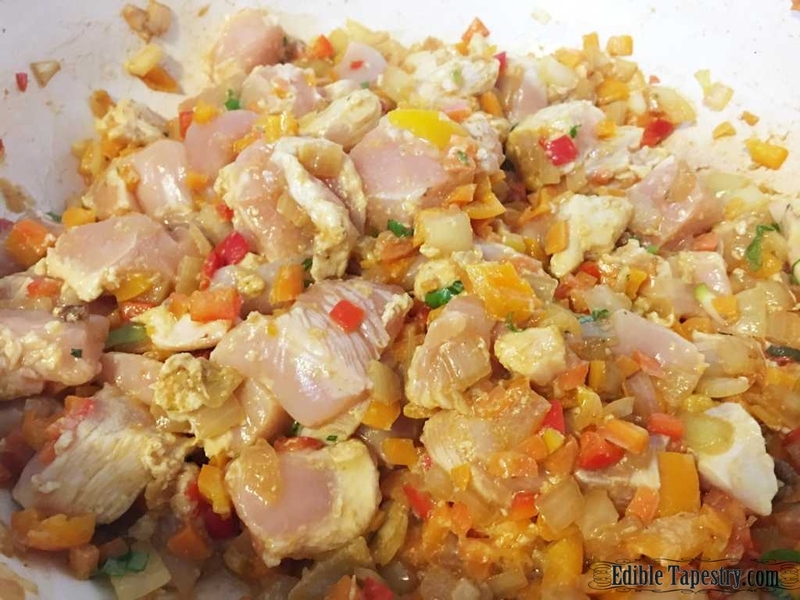 Sauté the chicken until nearly cooked through. 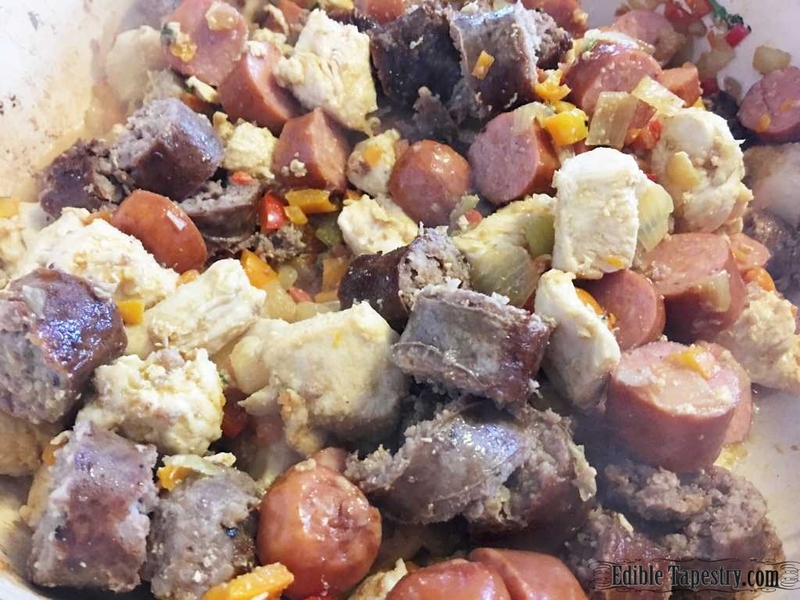 Add the sausage pieces, tomato sauce, herbs, spices, and stock. Bring to a boil. Add rice. Simmer, covered, for 1 1/2 to 2 hours, stirring occasionally. Season to taste the last half hour with extra cayenne and salt, if desired. Yield: 6 to 8 main dish servings.